The SC26-2 is a versatile, easy-to-use, and configurable safety controller used to monitor multiple safety and non-safety input devices, providing safe stop and start functions for machines with hazardous motion. The XS26-2 is a scalable version of the SC26-2 capable of supporting up to eight expansion I/O modules. The addition of the PROFINET industrial protocol to these safety controllers enables simple and robust communication channels to any connected devices that use the PROFINET standard, including devices from other manufacturers. This new functionality matches the capabilities available for EtherNet/IP, Modbus/TCP or PCCC. These models can be configured with up to 256 virtual status outputs which can be used to send non-safety status signals to programmable logic controllers (PLCs), indicator lights, and similar devices. They also support virtual non-safety inputs, including manual reset, On/Off commands, mute enable, and cancel Off-delay. Additional features new to both safety controllers include delay function blocks, which allow a user-configurable ON or OFF delay, and track function block status output, which indicates the state of a particular function block. These additions complement an already impressive set of pre-engineered and pre-tested function blocks to further simplify configuration, streamline operation, and improve functionality. 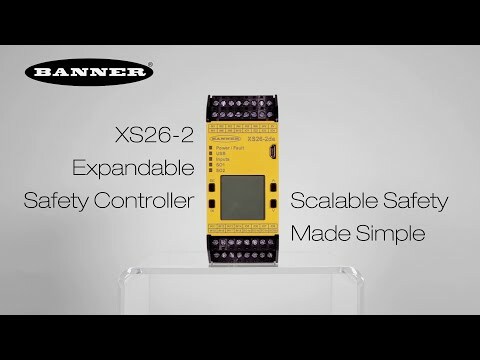 The SC26-2 safety controller and base controller models of the XS26-2 expandable safety controller have 26 input terminals, four terminals for two redundant safety PNP outputs, a USB connection for loading configurations, and an optional on-board display. To meet requirements of diverse applications, the XS26-2 platform offers six I/O expansion module models with a variety of safety inputs, solid-state safety outputs and safety relay outputs. For efficient terminal use, the XS26-2 base controller and expansion modules allow a portion of the safety inputs to be configured as outputs. Peu encombrant et doté de fonctions logiques booléennes, le SC26-2 est simple à utiliser, flexible et efficace.